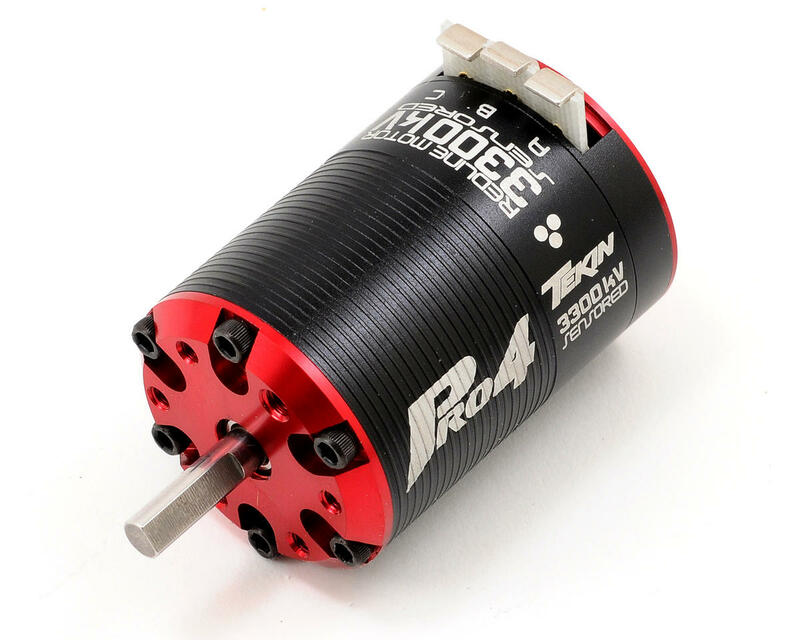 This is the Tekin 3,300kV Pro4 4-Pole Brushless Motor. 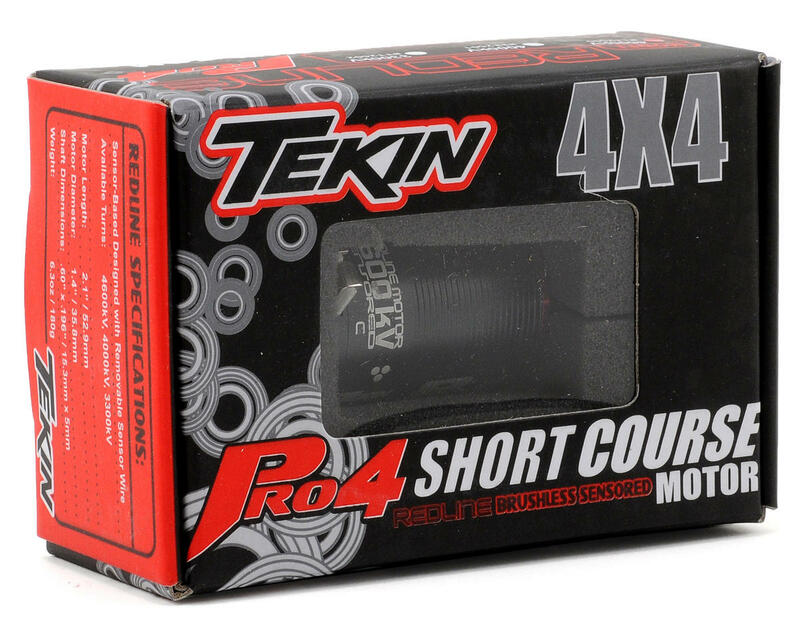 Tekin's Pro4 Motors set a new standard for 4 Wheel Drive Short Course performance. Utilizing the proven design of the T8 1:8th Scale motor, the Tekin Pro4 produces the torque and smooth power you demand for a 4x4 Short Course Truck. Specifically designed with KV ranges to complement 2s and 3s Lipo power systems, no other 10th scale motor on the market can deliver the power your 4x4 Short Course requires. Get a Tekin Pro4 Motor and never look back. To the gentleman above, if your looking for power and tons of torque you would have been better off with a 4600kv and a 2 cell Lipo with 100C burst ot or better. instead of that 3 cell. You shouldn't need to run a 3 cell. I run a tekin Rx8 and 4600kv with a turnigy nano tech 6600 130C battery and I get about 11 minutes or more on an 1/8 scale track. Running in a losi ten-scte 4x4. And turn down the power output on the ESC to 50. You won't lose any power but it will lower your motor temps. Hope this helps. What a great motor, been using it for the past year behind a tekin rsx esc in my t5m truck and Ive got nothing but good to say about it. I take this thing out and beat the hell out of it for no less than 3 hours at a time every time we go play and it never disappoints. Ive got nothing but good to say about any of my tekin products. Not too happy with the Tekin Pro4 motors so far. I have both a 3300KV and 4000KV with both motors failing with broken magnets within 1 month of purchase. Temps were kept below 180F and jumps were no higher than 3 feet on dirt. So far over $500 invested in the RX8 plus two Pro4 motors. I bought this sytem to be more durable and have longer run time than the stock motors before overheating (Traxxas Slash 4x4, Velenion 3500KV on 3S). I was not looking for better performance, the stock power system performance was fine with me. So far none of those goals are met. Bottom line is the motors are not holding up or running at lower temps than stock (so I did not get any extended run time vs. stock before overheating). By comparisoin, the stock motors were lasting 6-9 months with the exact same usage before needing a rebuild. Tekin warranty repair was immediate for the first motor failure. They replaced the broken rotor and shipped the unit back to me within a few days. However the repaired motor was not smooth when tuned by hand. The second motor is in the process of being returned now. If this continues, I plan to upgrade the 2650 KV T8 buggy motor and still only run on 3S. I have another Slash 4x4 with a Castle Mamba Monster and 2200KV motor that has been bullet proof for 2 years runing mostly 4S and some 6S with no issues. I know others have had good luck with the Tekin Pro4 motors, but not me.